This week's theme is TAILS - "Summertime memory"
As I try to preserve moments with my camera, I like to think I'm 'capturing memories'. I know you will consider me strange, but almost every critter I encounter in nature, creates its own memory with me. I find myself in awe of nature and honored that the critters of nature allow me to experience them. The Cloud Sulfur butterfly in the photo above definitely made a Summer memory with me. It flew up to me and proceeded to do a 'dance' in front of me. It fluttered around as if it was saying "Look at me! Look at me". 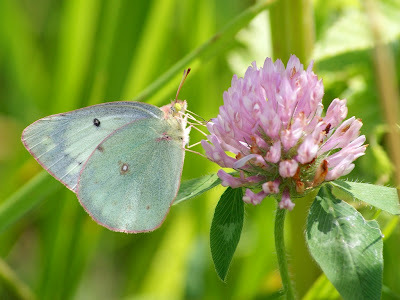 So, I did, in fact look intently at the butterfly fluttering in front of me, and I immediately noticed that the pink outlining the butterfly's wings matched the pink of the clover's flowers. However, each time it would land, as soon as I would put the camera to my eye, it would start fluttering around again. I could almost hear it say "Na na na na hehe". So, I chased this butterfly up and down the gravel road, until I FINALLY got the shot I was after. And, in the process, the butterfly and I created a "Summer memory". A snail and a goldfish walk into a bar. The bartender asks, "Where's Gina?" The two answer, "I dunno. We're hiding.."
A lovely picture. We're glad you stayed so persistent. what a fabulous way to create and recreate memories. I know people who take a picture of their child EVERY day... there are So many things I would give anything to see again...if only I had taken a picture!! Stunning photo! I'll remember this, too! Hi Misty, you captured a magical moment, magical because without your fast camera you might have missed taking this shot. Congratulations for an excellent picture.